Beginning April 1, 2012, the FHA is once again raising mortgage insurance premiums (MIP) on its newly-insured borrowers throughout Franklin and the country. It’s the FHA’s fourth such increase in the last two years. Beginning April 1, 2012, upfront mortgage insurance premiums will be higher by 75 basis points, or 0.75%; and annual mortgage insurance premiums will be higher by 10 basis points per year, or 0.10%. For borrowers with a loan size of $200,000, the new MIP will add $1,500 in one-time loan costs, plus an on-going, annual $200 increase in total mortgage insurance premiums paid. All new FHA loans are subject to the increase — purchases and refinances. The FHA is increasing its mortgage insurance premiums because, as an entity, the FHA is insuring a much larger percentage of the U.S. mortgage market than ever before. In 2006, the FHA insured 2 percent of all purchase-money mortgages. In 2011, that figure jumped to 18 percent. Unfortunately, as the FHA has insured more loans, it’s number of loans in default have climbed, too, forcing the FHA to boost its reserves. In order to calculate what your FHA annual mortgage insurance premium would be on a monthly basis, multiply your beginning loan size by your insurance premium in the chart above, then divide by 12. In addition, for loans over $625,500, beginning June 1, 2012, there is an additional 25 basis point increase to annual MIP. To avoid paying the new FHA mortgage insurance premiums, start your FHA mortgage application today. 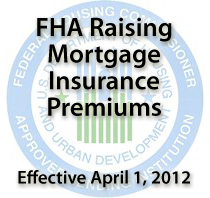 Existing FHA-insured homeowners will not be affected by the change. Mortgage insurance premiums will not rise for loans already made.